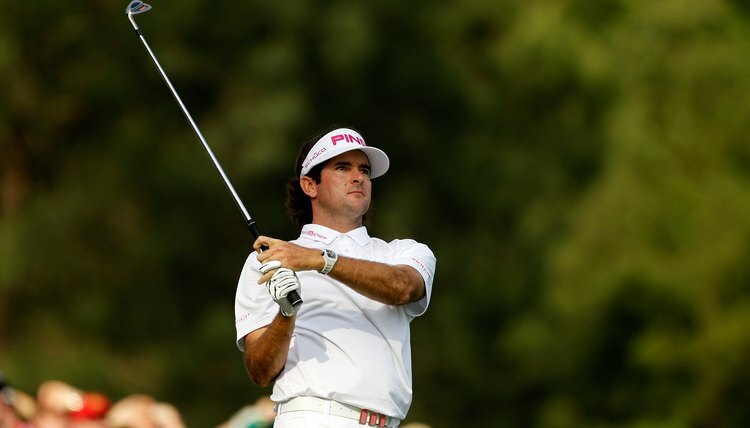 It'll take plenty of practice to swing the club as fast as 2012 Masters champion Bubba Watson. Many golfers dream of playing like a professional, but doing so is easier dreamed than done. You must begin with a certain amount of natural talent and then work hard to develop it. Beginning at age 12, pro golfer Jason Day practiced from 5:30 to 8:30 a.m. and from 3:30 to 6:30 p.m. every day under the guidance of his coach. Hire a coach. If you’re a beginner, take lessons with a local PGA pro. If you’re a low-handicap player, use the best swing coach you can find. Even top PGA Tour pros use swing coaches. For example, Butch Harmon has worked with Tiger Woods, Phil Mickelson, Greg Norman and Ernie Els. Hank Haney has coached “over 200 touring professionals,” according to his website, including Woods and Mark O’Meara. Publications such as “Golf Digest” and “Golf Magazine” publish lists of the top golf instructors in the United States. Increase your swing speed. “Golf Digest” reports that a player who typically scores in the 80s has a swing speed of about 89 mph. The 123.24 mph swing of 2012 Masters champion Bubba Watson is among the fastest on the PGA Tour, according to 2009 PGA Tour statistics. Golf writer Steve Newell says a slow swing speed is often caused by a reverse pivot, in which a golfer shifts his weight forward during his backswing, then backwards during the downswing. Off the tee, Newell suggests setting up with 60 percent of your weight on the back foot. Shift another 10 percent of your weight to the right foot (for a right-handed player) on your backswing, then shift your weight forward during your downswing. Learn to hit draws and fades. Professional golfers exercise excellent control over the ball, often purposely hitting a fade, which travels from left to right (for a right-hander), or a draw, which moves from right to left. To hit a draw, Newell explains, play the ball a bit farther back in your stance than normal, aim your body to the right of the target, then aim your club face at the target, effectively strengthening your grip. Do the opposite to hit a fade. Play the ball an extra ball-length forward in your stance and align your feet, hips and shoulders to the left of the target -- essentially opening your stance -- while again aiming the club face at the target. Improve your short game. Even if you don’t reach the pro level, improving your short game, and especially your putting, is the best way to trim strokes from your score. There are different ways to putt, so you’ll have to experiment to find the technique that best suits your game. If you choose to keep the club face on the target line throughout your stroke, for example, Tom Watson suggests practicing by laying two putters parallel with each other on the green, slightly farther apart than the length of your putter’s head. Try to hit balls from between the two clubs without touching either one. How Do I Hit a Fade Golf Shot?